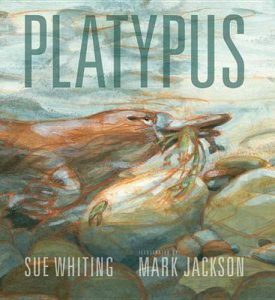 Sue Whiting is a stalwart of Australian literature for young people. She writes across categories, including picture books, non-fiction and novels for children and young adults and has had a successful career in publishing for Walker Books Australia. 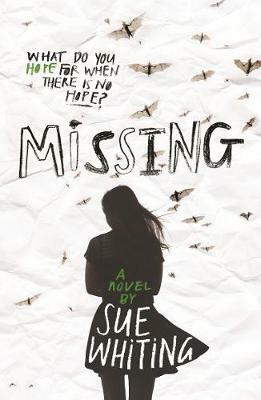 Her most recent work is Missing, a novel for middle grade. Thanks for speaking with Boomerang Books, Sue. I am based in a small coastal village about an hour south of Sydney. 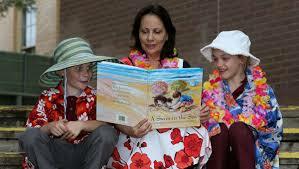 I started my working life as a primary school teacher, specialising in literacy education and Reading Recovery. In 2005, I left teaching to pursue a career in publishing and was Publishing Manager and Senior Commissioning Editor at Walker Books for ten years. What led to your career in children’s books and what are some highlights? I developed a passion for children’s books as a young teacher and this eventually led me to want to write my own books. It took me about ten years before I was brave enough to give this writing caper a crack though. Editing, well, I fell into editing by extreme accident – through submitting a manuscript to a small start-up publisher and ending up with the job as editor of their children’s list – but once I started working in this field, I found that I loved this side of the process equally as much as writing. And I learnt a heck of a lot about writing along the way too! Highlights! Wow, that’s really tricky, because there have been so many. Holding your book baby for the first time is always very special, but the unexpected letter or email or message from someone who has been touched by your work in some way is without doubt the best feeling ever. Just last week, I received a video message from a three-year-old boy telling me how much he loved one of my early novelty books. That was pretty awesome. In terms of my publishing career, I think nurturing the early careers of wonderful writers such Meg McKinlay, Sandy Fussell and Anna Branford, to name but a few, stands out as a highlight and what I am most proud of. Could you tell us about some of the books you’ve written? I write across many age groups and genres, from picture books through to YA. 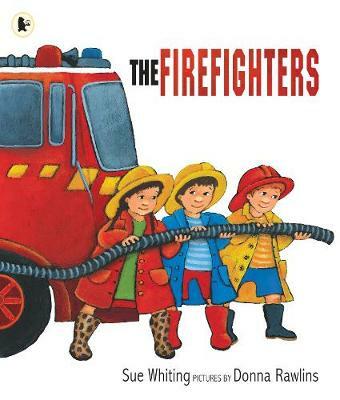 My bestseller is The Firefighters, illustrated by Donna Rawlins. It celebrates its tenth year in print this year, which is wonderful, as books don’t tend to stay in print for very long these days. My award winner is A Swim in the Sea, illustrated by Meredith Thomas and my last published book was the nonfiction picture book, Platypus, illustrated by Mark Jackson. It was such a joy to write because I was able to write lyrically about this unique Australian animal. 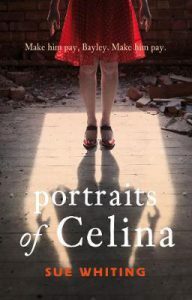 The Firefighters, Platypus and my YA novel, Portraits of Celina have all been published in the US and Platypus has just recently been published in Korea. 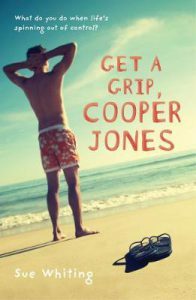 Missing is my first middle grade novel since Get a Grip, Cooper Jones, which was published eight years ago. What genre is your new book Missing and what is the significance of its title? Missing is a contemporary mystery/suspense novel for readers 10+. The story revolves around the disappearance of the mother of my central character, Mackenzie. So the title refers directly to the fact that Mackenzie’s mother is missing. But the word “missing” has many connotations. I love that it also relates to Mackenzie missing her mother, her missing out on so many things because her mother is missing and also her quest to find the missing pieces in the puzzle of her disappearance. Could you tell us about your protagonist Mackenzie and some other characters? Mackenzie is a pretty typical twelve-year-old girl. She lives in southern Sydney and is caught up in the excitement of the last weeks of primary school when her mother goes missing. She loves art, particularly working in black and white. Maggie da Luca is Mackenzie’s mother. She is a bat biologist and academic who works for a scientific magazine. She often travels to remote corners of the globe to study and photograph bats for the magazine. Joe is Mackenzie’s father. He is an insurance salesman. He falls to pieces when Maggie goes missing. He is a man with many secrets. Lois Simpson is Mackenzie’s gran. She is a scientist and academic and is the person who Mackenzie leans on as she tries to deal with this tragic situation. She too has secrets. At high school, Mackenzie befriends Billie. Billie is lively and impetuous and a great foil to Mackenzie’s grief. In Panama, Mackenzie meets Carlo. Carlo is fourteen and helps his uncle at the hotel Mackenzie and her father is staying at. His indifference infuriates Mackenzie, but she eventually discovers that he is someone she can trust. Why have you given Mackenzie a gift for art? I wanted Mackenzie to have a passion that was in opposition to her mother and grandmother’s love of science. Art was the obvious place and very early on I saw Mackenzie, in my mind’s eye, sketching bats. A trip to the NSW Art Gallery where I happened upon a sculpture of fruit bats hanging from a washing line was the moment that sealed the deal. Much of the story is set in the jungles of Panama. It’s hard to believe you’ve never been there. How did you create such an exciting and authentic-seeming setting? What was your most surprising discovery about Panama? I have to admit to feeling a tad guilty that I didn’t jump on a plane and spend weeks in the country to ensure I got it right, but truthfully, I just didn’t have the funds to do that. So I resolved to do everything I could to bring Boquete and Panama to life on the page through diligent research from afar. I researched Panama for about a year – mostly through the Internet. Boquete is a tourist town, which also has a large expat community, mostly American retirees. This worked in my favour as there were many blogs and vlogs I could access depicting everyday life in the town. I also had two really lucky breaks. One was making contact with Dianne Heidke (sister of Australian author Lisa Heidke) who has lived in Boquete for a decade or more. Dianne was able to answer those questions I couldn’t find answers to on the Internet, and was able to give me access to that all-important local knowledge. She also read the final manuscript and acted as my sensitivity reader. My second lucky break was the discovery that the local council streamed 24-hour feed of Boquete’s main square live on the Internet. I was able to watch the comings and goings across the square day and night. It felt slightly creepy and very stalkerish, but it really helped me to understand the rhythms of the town. My most surprising discovery was the lack of resources of the police force in Boquete – to the point that sometimes they don’t have enough petrol to run their police car! Why have you structured the story as ‘then’ and ‘now’? Initially, I chose to structure the story this way so that I could move the story on from those early days when the family had just learned of the disappearance and when their grief would be too raw and impossible to bear. But as the story idea progressed, I quickly realised that the ‘then’ and ‘now’ structure was allowing me to create suspense and tension in an intriguing way. It was challenging to maintain, but I loved slotting in key information at just the right places. How have you used bats as a symbol? I used bats more as a link between Mackenzie and her mother than as a symbol. It was Mackenzie’s way to stay connected with her mother and her mother’s passion. However, bats do symbolise our ability to see our way through even the darkest times. Mackenzie and her family have to navigate through some very dark days through much of the story, but by the end, I hope to show them stepping out into the light. This was a happy accident that gave extra meaning to the final pages in particular. During the novel you tantalise characters and readers with mention of gelatos. What’s your favourite flavour? The gelatos were a nod to my time at Walker Books. There was an excellent gelato bar at the bottom of the building and we often had Gelato Fridays. My favourite was definitely salted caramel Greek yoghurt. You are known for promoting your books in interesting and skilled interactions with children. How will you be promoting Missing? Thank you for that! I love sharing my books and stories with groups of kids – it’s my favourite part of my job. I am about to embark on a schools tour of Brisbane and Sydney, so have been busy preparing my presentations. My reasons for writing the story and my research and how I have used it will be the centre of my talks, as well as some scene-setting with a bit drumming, a lot of drama, and concluding with a “breaking news” report. I will also be doing writing workshops in Sydney and Melbourne – exploring how to create suspense in stories. 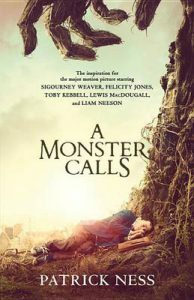 I have just reread (for the fifth time) A Monster Calls by Patrick Ness. It is one of my favourite books of all time – so beautifully crafted and emotive. I also recently enjoyed The Golden Age by Joan London and All the Light We Cannot See by Anthony Doerr. What’s next workwise for you? I am working on a new middle grade novel with the working title of Chance. It too has a core mystery and is about truth and lies and the grey area between the two. I also have a new picture book Beware the Deep Dark Forest illustrated by Annie White, which is due for release in October. Thanks for your generous and enlightening answers Sue, and all the best with Missing. It is a gripping and original work with great appeal for young readers. My first foray into the sea was a moment in time I remember as vividly as a blistering Aussie summer sky. It was in the surf off Magnetic Island in a sea a mere metre high but to a person of toddler stature, the waves were mountainous. It was a character building exercise my mother seemed intent on, not relinquishing her grip on my wrist for a minute. As she dragged me further in, my apprehension escalated and I begged her not to let go. However high expectations can assuage fear and doubt and in A Swim in the Sea, Bruno experiences all these sensations. Bruno has never been to the beach before. He can’t wait for Mum and Dad to have breakfast and pack the car. He is simply busting to get there and searches excitedly for his first glimpse of ‘the big blue sea’. At first it is every bit as exhilarating as he anticipated; all ‘sizzling sand’ and ‘salty breezes’. But Bruno’s enthusiasm soon ebbs as he is confronted by his first wave and alas, like me, is slightly overwhelmed and terrified by the huge, ‘white foamy wave monster’. All that sparkled minutes before becomes dark and threatening for Bruno and no amount of exotic sea-creatures or rock pool treasure can entice Bruno out from his dread until his sister, Tessa, enlists him to help build the wall for the family sand castle. Perhaps Bruno is feeling a little sheepish after his encounter with the big blue sea. Maybe it’s the sensuous feeling of the sand as he digs that lures him out of hiding. Or it might just be being part of a team that helps Bruno finally regain his sense of purpose and fun because soon the castle is enclosed with a magnificent wall, strong enough and high enough to withstand any rougue wave…almost. A Swim in the Sea is as enjoyable to read as licking a cone-full of gelato. Sue Whiting neatly avoids the usual beachside unmentionables such as sea lice, sunburn, stingers and sand in your togs in favour of the less tangible emotions of excitement and anxiety. The naivety Bruno possesses not only fuels his expectations but also foments his apprehensions into something almost too gigantic for him to deal with; as gigantic as the ocean itself. Just as Bruno has us teetering on the edge of fear, Whiting draws us back with reassuring images of backyard paddle pools and ‘sparkly blue jelly’, images that any kid, even those who’ve never breathed in the briny scent of the sea before, can relate to. The beguiling acrylic paintings used by Meredith Thomas to illustrate Bruno’s adventure swirl and surge across the pages providing bucket-loads of textural depth and fluidity. I especially love Bruno’s faithful little unnamed brown dog who mirrors every moment of Bruno’s pleasure and pain, and ultimately relishes his swim in the sea as much as Bruno. A Swim in the Sea is a superb little slice of summertime fun and perfect to read with pre-schoolers, beach lovers and those still slightly wary of the surf like me. Because overcoming your fear and enjoying the moment is often just a matter of letting go, which thankfully my mother didn’t. 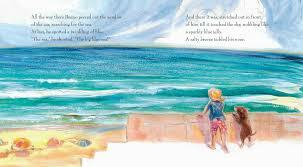 Check out more of Sue Whiting’s books and buy A Swim in the Sea here.